Oil pulling (Gandusha) using sesame oil is advised in conditions like sensitive teeth, tooth pain, weak teeth, diseases of mouth like pyorrhea, ulcers, and cancers. Oil pulling method requires the patient to put 1-2 spoons of sesame oil in the mouth and properly rinse for 5-10 minutes, but not to swallow it. Ayurveda identifies sesame oil as Madhur (sweet) oil which when used in everyday cooking improves digestion, provide wound healing, and improves intelligence. Massaging skin with warm sesame oil followed by a warm water bath can hugely improve the skin quality by reducing blemishes, dryness, and sore spots. Sesame oil is considered best for hair massage as it helps to reduce premature hair greying, hair fall, and dull hair. 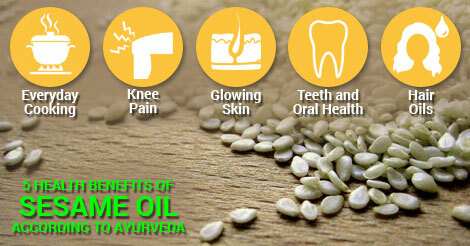 Maha Narayana oil prepared by heating some black pepper seeds in sesame oil is a great remedy for knee pain due to arthritis or senile changes.